Between 2005 and 2014, sales of US crop commodities rose 25 percent, from less than $150 billion to over $200 billion. The average employment of hired workers on US crop farms covering their workers under unemployment insurance rose two percent, from 549,000 to 557,000, but average employment in crop support services, nonfarm firms such as labor contractors that bring workers to farms, rose by 15 percent, from 280,000 to 321,000. In California, average direct-hire employment on crop farms fell one percent, while average crop support services employment rose 23 percent, so that more workers were brought to California farms by crop support services than were hired directly. 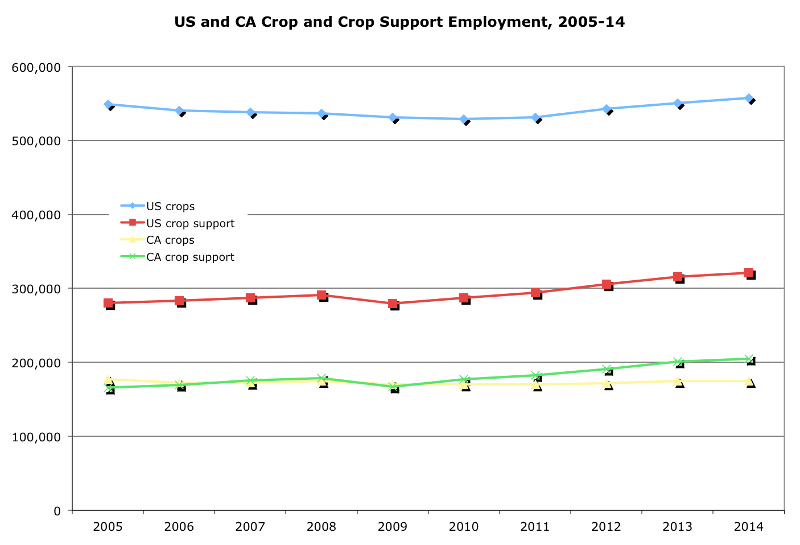 Almost two-thirds of US crop support employment is in California.